The Research and Development Department at Sun Chlorella Corp. reports detail of analysis and studies for health food, and supplements. and the presenter was awarded the Presentation Prize. It has been known that the intake of Chlorella as vegetable food increases folate and vitamin B12 levels in the blood and contributes to a reduction of high total homocysteine and cholesterol levels. However, the bioavailability of nutrition obtained from diet changes depending on gene polymorphism and life stages. Therefore, we conducted gene expression analyses, focusing on One-Carbon Metabolism (OCM) involving folate and vitamin B12 to explore potentials of Chlorella as food. Three male subjects (in their 30’s, 40’s, and 50’s) received 8 g/day of Chlorella food for one year. MTHFR C677T polymorphism that is related to bioavailability of folate was determined and the diet survey was conducted prior to the start of research. General blood tests and gene expression analyses were conducted at baseline and every three months thereafter. The determination of MTHFR C677T polymorphism confirmed each one subject with TT genotype that shows poor folate bioavailability, CT genotype that shows slightly poor folate bioavailability, and CC genotype that shows usual folate bioavailability. Although the diet survey showed that the estimated intakes of folate and vitamin B12 exceeded the dietary reference intake in all three subjects, the subject with TT genotype at baseline had blood folate level close to the lower limit and total plasma homocysteine (THCY) level markedly higher than the upper limit. 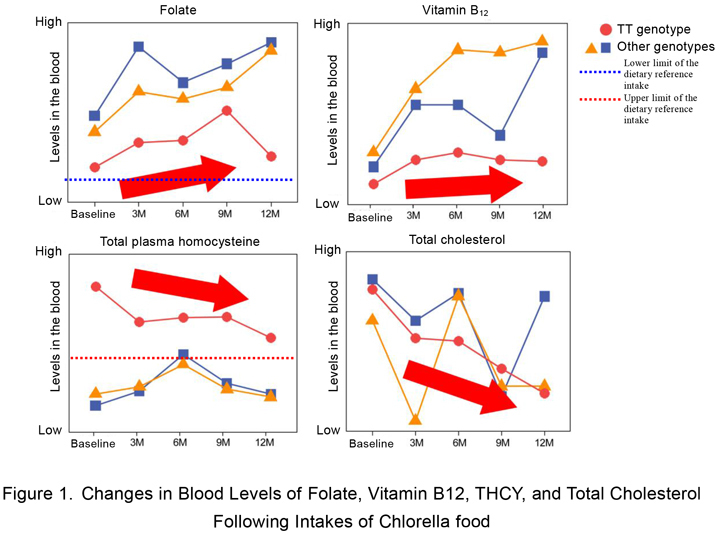 However, blood folate and vitamin B12 levels increased following 3-month intakes of Chlorella food. Subsequently, not only the folate and vitamin B12 levels were maintained, but also THCY and total cholesterol levels significantly decreased in one year (Figure 1). Furthermore, gene expression analyses confirmed the increased expression of cystathionine beta-synthase (CBS) that converts folate reduction transporter SLC19A1 and homocysteine to cystathionine, regardless of MTHFR C677T gene polymorphism (Figure 2). The above results suggest that the intake of Chlorella food not only increases blood folate level and significantly decreases THCY and total cholesterol levels, but also contributes to an increase in OCM. Although this is preliminary research, Chlorella food is considered useful for supplementing nutrients regardless of gene polymorphism and varied life cycles. This leaflet reproduces presentations made in scientific journals or meetings and is not intended for sales or promotion of any product.